Ophira Calof successfully carried Generally Hospital from start to finish. The entire cast was talented and funny, but Calof’s sunny optimism stole the show. Calof managed to sell the opening number, a song to a bunch of new nervous doctors about how “everybody’s probably gonna die”. It successfully set the tone of the show and made me look forward to what was going to happen next. All of the sketches were fantastic! What made Generally Hospital great was that all the material was funny because it’s true. It effectively humanized people working in healthcare, while highlighting relevant issues in the medical system. Leigh Cameron’s directing effectively brought all the sketches together in a cohesive and understandable way. Some bits were especially memorable. Sabrina Friedman did a fantastic job as the tired and overworked nurse who got frustrated with the bickering couple. Her explosively funny outburst in that scene is possibly how some nurses wish they could behave near the end of a 12-hour shift. The herpes song was memorable precisely because herpes is such a taboo topic. The doctor’s (Alia Rasul) delivery of herpes facts that the distraught couple in that scene didn’t want to hear gave the song that bit of extra panache. Lastly, the scene where Ophira Calof’s character had to get an MRI scan was both hilarious and very relatable to me as someone who is anxious. The apprehensive look on Calof’s face, combined with the rest of the company acting as the MRI machine was gold. The way everyone one else tickled, poked, and prodded Calof’s body while in the middle of the MRI scan was an excellent bit of physical comedy. Of course, the million-dollar question on my mind is what people who actually work in healthcare think of Generally Hospital. I can only speculate. There were also a few scenes and comments that definitely weren’t appropriate for children, or anyone prudish. Ultimately, though, Generally Hospital was a show I enjoyed from start to finish. The show ended on a positive and encouraging note, with a song about healthcare providers who aim to make a difference in their patients’ lives (mainly featuring characters from previous sketches). 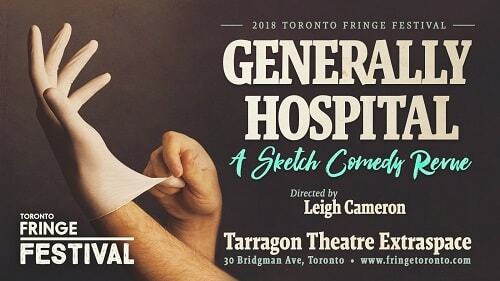 Generally Hospital is a show which proves that laughter is the best medicine. I recommend that you see it at this year’s Toronto Fringe Festival. Generally Hospital Poster design by Wojtek Arciszewski.